As the school year closes and we celebrate Mother's Day, I thought it might be time to do a little self-evaluation to see how I'm doing as a mom. I have to do these at work and (wouldn't you know) I tend to do really well! However, being a mom is WAY harder than being a lawyer. There are no hard and fast rules, no wealth of case law, no judge to make decisions for you. Just us parents, winging it as well as we can. Some parts of parenting comes naturally, and others...not so much. 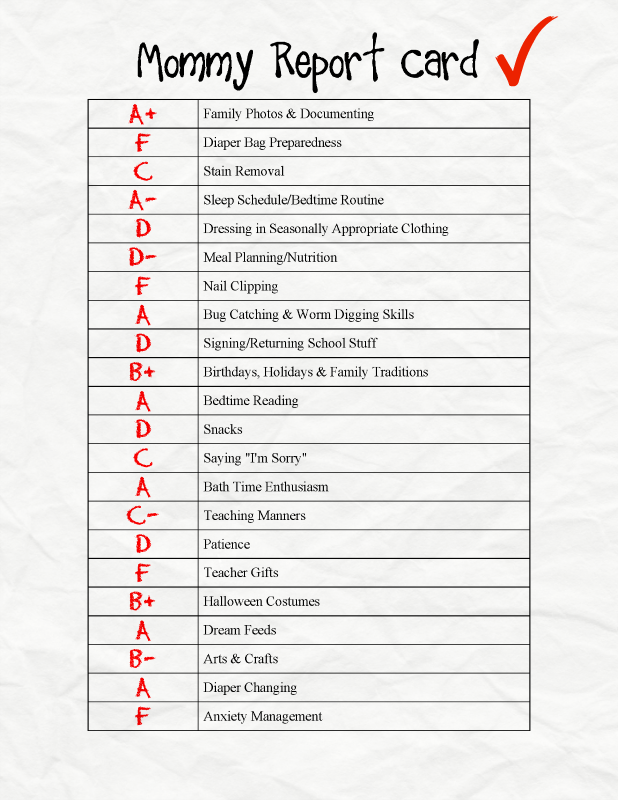 We all have our strengths and weaknesses, so I thought I'd share my "Mommy Report Card" with you. How would you grade yourself as a mommy? What are your best and worst subjects? Okay this report card makes me feel like you are such a boy mom!! haha!! I am the same way!! Bring on bug catching and bird watching!!!!!! Omg I love this! And I love knowing that other moms definitely slack in some areas. :) Thanks for making us all feel better about ourselves and I may steal this for a future blog post of my own! P.S. From your blog, I think you are a fabulous mom--one of the best!! I am cracking up at your A for bath time enthusiasm. I saw your post bath picture on IG and I have to say, you get an A++ in that category! Nail clipping...I'm right there failing with you! How do they grow so dang fast?!? This is so cute. I love this. I'm getting the low grade on meal planning and nutrition. I'm also not going to give myself a good grade in family photos and documenting or worm digging skills. I did do a really good job with my Teacher Appreciation Week gifts though--so there's one thing to be proud of. I feel like I both always and never cut Aria's nails. All of a sudden they are daggers and didn't I just trim them a few days ago? I'm getting an F for meal time tonight. All the things I thought to make we were missing one ingredient. So, um grilled cheese and cucumbers? Really cute idea though! We all have those strengths and weaknesses. Um maybe we should change some categories ;) you know manipulate the parameters! Love this. And you get an A+ from me! I love this, so sweet & humorous! Glad your big catching is on point! My vehicle identification is an "A" while my playdoh skills are a big fat "F"! This is so fun! 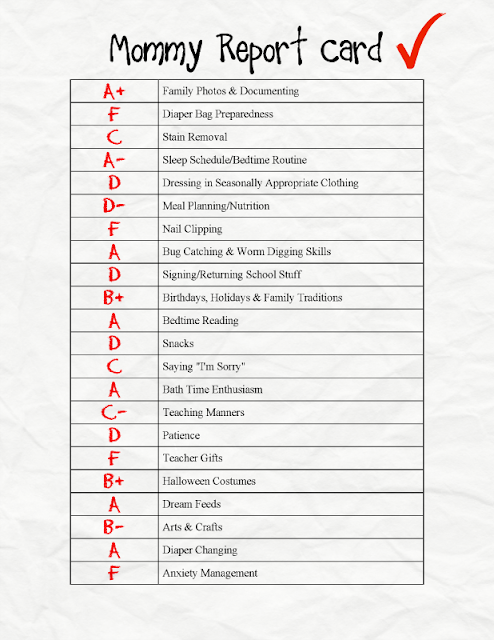 I love the idea of a mommy report card. You for sure deserver an A+ overall mommy, though! Filling this out for myself: A for sure in the snack category. I feel like I'm basically a walking pantry. This is so cute & some of it doesn't apply to me as a stepmother to two teenage girls but I will say that "anxiety management" would be a "Z"...if that was possible for me. Ha! Ha ha! That is awesome! I'd get an F in diaper bag preparedness too because although I have one ready and updated in the van I never take it inside anywhere with me. I have a small bag inside my purse with diapers and wipes and that's what I take. I have never seen one of these before but I love it! This is awesome! I do this in my head all the time without realizing it. I used to be good at meals and nutrition and now pregnant with #2 I'm failing this subject terribly. Love this!